Many individuals who need their vision corrected but don't the like idea of wearing glasses turn to contact lenses ("contacts") instead. These small, flexible lenses sit on a layer of eye moisture over the center of the cornea, correcting the refractive errors and other eye abnormalities that cause vision problems. While modern soft contacts provide considerably more comfort than the hard contact lenses of old, they can still cause irritation or fail to correct your vision adequately unless they fit your corneas perfectly. Here at Maple Ridge Eye Care, our Maple Ridge optometrists offer a custom contact lens fitting to ensure that your new contacts feel great and do their job flawlessly. A custom contact lens fitting can make all the difference between comfortable vision correction and an unusable, painful nuisance. Contacts that do not fit properly may cover too much of the corneal surface, preventing oxygen from nourishing the tissues. This can cause the cornea to swell, resulting in itching, pain, eye fatigue, redness and irritation. When you hear people complain about their contacts bothering them, chances are that they failed to get a proper custom contact lens fitting. That's why our Maple Ridge optometrists insist on making sure your contacts are fitted to your corneas' exact specifications. A custom contact lens fitting from our Maple Ridge optometrist can correct your vision in ways older versions of this technology never could. Today we have multifocal ("progressive") contacts that provide the same uninterrupted correction across all visual fields as our "no-line" multifocal glasses. This innovation makes contacts an option for individuals who always had to settle for bifocal or trifocal eyeglasses in the past. It's also possible now to correct astigmatism with contacts. Even if you'd always ruled this form of vision correction out as "impossible" for you, our Maple Ridge optometrist can most likely provide a custom contact lens fitting that gives you beautifully clear eyesight. 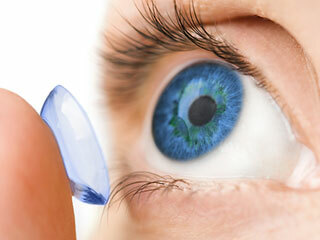 Did you know that the contact lenses offered by our Maple Ridge optometrist can improve more than just your vision? Many of our patients opt for colored contacts that give them the striking blue, green or brown eyes they've always wished they were born with. We can also fit you with contacts colored to hide any abnormality in eye pigmentation without actually altering the overall color. Our custom contact lens fitting includes detailed training and tips on how to insert, remove, and care for your new lenses, along with information on how often they should be replaced and when to schedule follow up appointments with our Maple Ridge optometrist. All of this important information and help (including exchanges, if needed) is included in the cost of the service, and of course the lenses themselves are warrantied. Our Contact Lens Order Form makes re-ordering easy and convenient, and we frequently offer discounted prices on cleaning solution and other supplies. Contact us today!